As part of the Punjab Government’s resolve to rehabilitate the families of the victims of the Amritsar Rail Tragedy and lend helping hand to the injured, a joint team of Punjab Cabinet Minister under the leadership of Health Minister Brahm Mohindra today visited various 5 hospitals to enquire about the recovery of the injured persons who are under treatment in these hospitals after Rail Tragedy. Financial help by way of cheque of Rs. 50 thousand was given to each of such injured person. Another cabinet colleagues who were accompanying Mr. Brahm Mohindra included Mr. Navjot Singh Sidhu, Sukhbinder Singh Sarkaria and Sadhu Singh Dharamsot.Expressing his satisfaction over the prompt delivery of quality medical care and treatment to the victims of the Rail Tragedy, The Health Minister Mr. Brahm Mohindra announced to grant financial help to the tune of Rs. 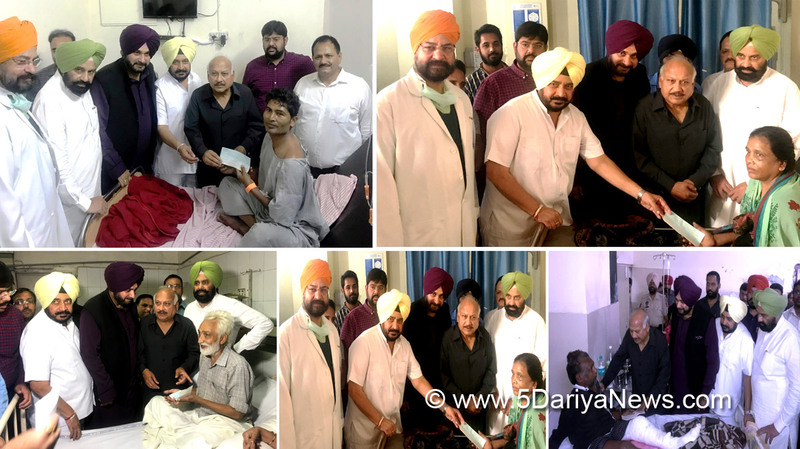 10 lakh to the Civil Hospital, Amritsar and Guru Nanak Hospital for his discretionary fund. This amount be spent for purchasing the machines required for the urgent treatment of the patients. Brahm Mohindra called upon the administrative heads of all the hospitals where the injured of Rail Tragedy are under treatment, to discharged these patients after their full recovery. Health Minister showered high praise over all such doctors and para medical staff who worked 24X7 with missionary zeal to mitigate the miseries of the victims by providing medical care and treatment at the crucial hour.He reiterated that Punjab Government would ensure that all the victims are getting free medical treatment and their families are rehabilitated. He expressed satisfaction over the announcement of Amritsar Corporation to give job to family members of the victims and said that this goodwill action would provide livelihood to the affected families.Mr.Navjot Singh Sidhu said that all these affected families are just like my own family and I would leave no stone unturned for the welfare of these families especially for the education of the children of these familes. Mr. Sarkaria also used high words of praise for the timely actions taken by the Punjab Government for the rehabilitation of these Rail Tragedy stricken families.